The 9-hole Lewis & Clark Public Golf Course in Astoria, OR is a public golf course that opened in 2005. 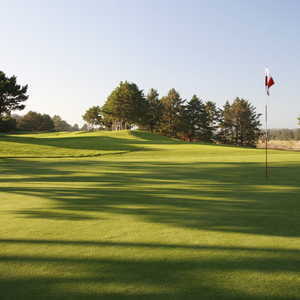 Lewis & Clark Public Golf Course measures 2738 yards from the longest tees. The course features 2 sets of tees for different skill levels. NOT ready for a PGA event. Artifical greens, lost balls 2" off fairways. BUT very nice and friendly fairways and well maintained. A good golfer will find a way to enjoy this course. At $25 with pull cart, who could complain? Full price for everyone, children, and dogs maybe even your cat. The fairways are alright but the greens are like your grandmas fake grass you set out in front of the camp trailer. My group and i got lost a few times until we found next hole, and then point a different group in the right direction because they were lost also. They still couldn't figure it out. They should start a goose and duck hatchery because there is duck feces everywhere, on your shoes on your pants on your clubs on your bag on your gloves. But if you want to get the cart stuck in the pond and bring the tractor to drag it out this course is for you. This is not a golf course. It is a field with fake greens and flags. My grandson liked it because I let him drive the cart. He was 7 and was charged full price. I could have given 5 stars, because the experience of playing this course was unlike anything I've ever played. A real novelty in the golf world. 7 artificial greens, most were the size of a small living room, and two grass greens that weren't real greens- just a lower cut of the fairway- weeds and everything! On several holes you lost orientation as to where you were shooting and NEEDED a map of the course to figure out where to go. Not the place to go if your expectations are for a real golf course. 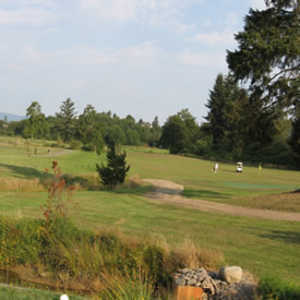 But certainly worth the green fees just to be able to say you played one of the weirdest courses in Oregon. i would not recomend playing this course. fake greens and not very well taken care of fair ways. their are two holes that dont even have greens. you are shooting into a 8 inch pipe that has a flag stuck in it. the course was cheap. but not very fun to play.